Peter Rabbit Posting A Letter Miniature Figurine - A3486. From the Border Fine Arts World of Beatrix Potter Miniature Figurine Collection. Height: 7.5cm. This is a charming addition to the miniature figurine collection illustrating the various childrens book characters from Beatrix Potter. 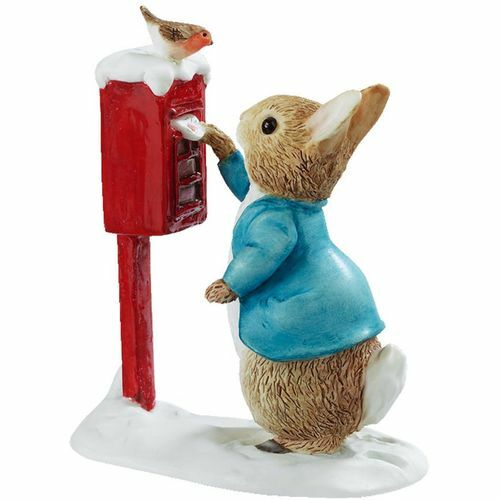 Adorable Peter Rabbit posts a letter in a red letterbox adorned with beautiful white snow whilst being watched by a perched red-breasted robin. He wears his famous blue jacket and brown slippers. This piece would make a wonderful seasonal gift, especially for children or those familiar with Potters works, but is also an excellent collectors item. Border Fine Arts has been producing The World of Beatrix Potter resin figurines since 1987 and over the years, it has developed an impressive range of collectible items that appeal to Beatrix Potter patrons of all ages and from all walks of life. They also produce a fabulous range of earthenware figurines in the Beatrix Potter Classics collection. More mature customers may well appreciate the value of these classic collections, but the characterful, handcrafted and hand painted figurines also make a wonderful gift for children of any generation.